Your garage door remote can get quite a lot of wear, especially if the garage is the main point of entry for your home. Entry to your home at the touch of a button can often be taken for granted until one day your garage remote doesn’t work, or worse, you can’t find it anywhere! At Speedie Shoe Repairs on the Gold Coast we don’t just provide the garage door remote or gate remote, we also offer the technical guidance and support to code the new garage door remote. You name it, we’ve got it. We stock a wide range of garage door openers so that we can cater to all our client’s needs. 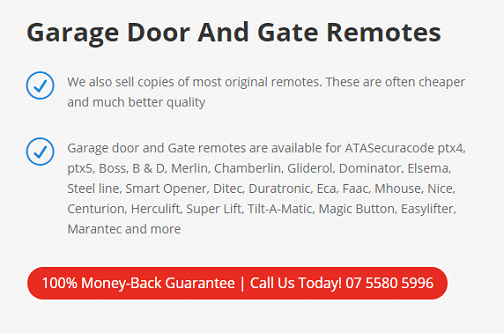 We can provide genuine and aftermarket garage door remotes, and we can advise you on the best solution for you. Are your access remotes becoming a bit of a handful? If you want to sync your gate remote and garage door remote to one simple remote, we can provide a receiver, and voila! You can now access all areas with one remote. When moving homes, we always advise that you change your locks and get new house keys as a security measure, but have you considered getting your garage door remote recoded to protect your Gold Coast home or business? Pop into Helensvale Plaza (not Westfield) and Col can do it while you wait. With 20 years in the trade, you are in good hands. At Speedie Shoe Repairs, we’re more than just shoe repairs, we can also provide cheap car key cutting, house key cutting, garage door remotes, watch repairs, engraving, and shoe repairs on the Gold Coast. Not sure what garage remote you need for your Gold Coast home or business? Help is just a phone call away, call 0400 966 201 or 07 5580 5996, or drop into Helensvale Plaza, not Helensvale Westfield, and Col can organise it all for you.